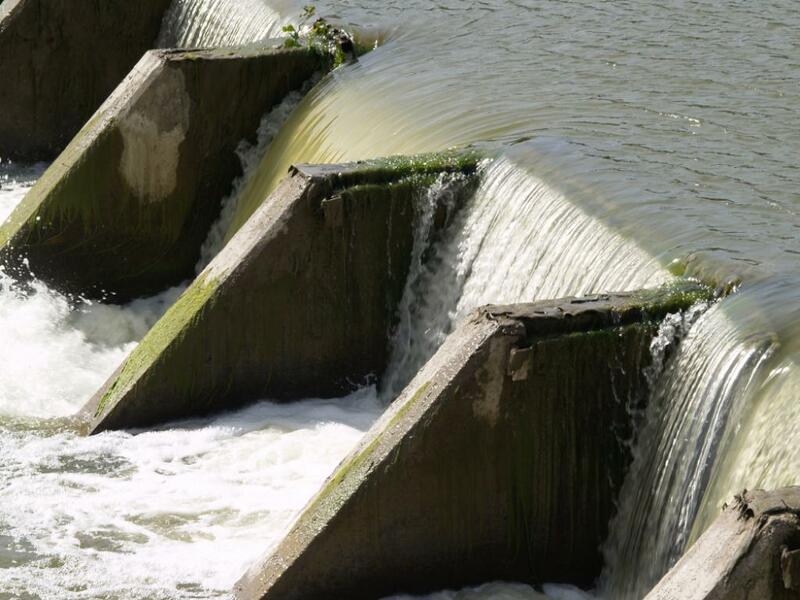 Around 3,700 new dams are currently proposed in developing countries. These dams regulate river water for irrigation, hydropower production and supply to municipalities. But dams are also known to cause irreparable damage to freshwater biodiversity and to the livelihoods of indigenous peoples dependent on ecosystem services of floodplains and free-flowing rivers. Unprecedented regulation of rivers and tinkering with the habitats of fish due to dams can lead to the extinction of many types of fish. 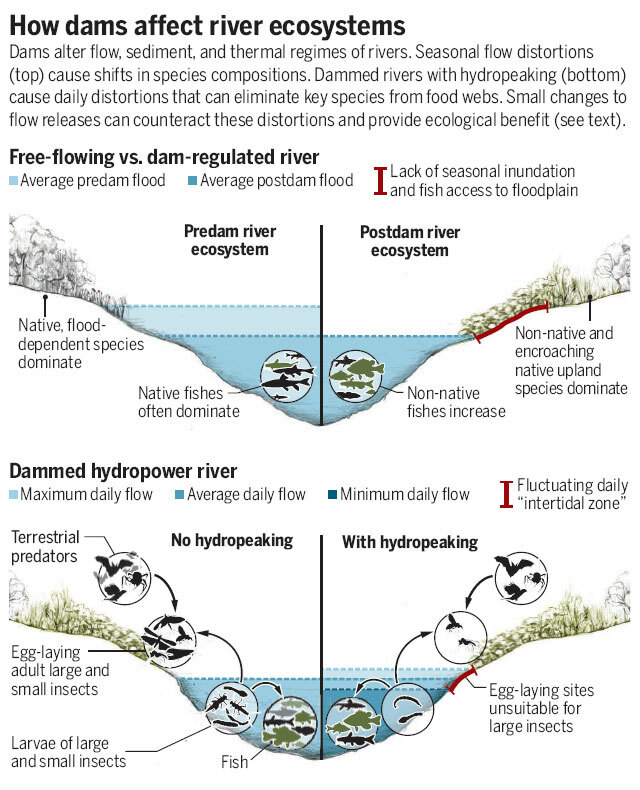 A new study, however, offers a way to mitigate the damaging effects of dams on fragile river ecosystems. In a study by T A Kennedy and others, published in BioScience, scientists proposed that by eliminating hydropeaking on weekends during the prime reproductive season of insects can help revive the highly fecund aquatic biodiversity. Hydropeaking is the release of water during daytime when demand for electricity is the greatest. The fluctuation of daily pattern of water flows can severely impair downstream shoreline habitats (see figure). The new study shows that aquatic diversity was lowest when hydropeaking is greatest. Based on this result, they offered an approach to recover the aquatic species in abundance in a few years. The study found that small insects were two to three times more abundant than large insects in areas where water level decreases due to hydropeaking. Restricting hydropeaking on weekends—when demand is relatively low—can restore the integrity of the food web. Large insects would enhance productions of river fishes and thus, predators that eat flying adult insects such as birds, bats and spiders, explain N LeRoy Poff and John C. Schmidt in an article on the study in sciencemag.org. The research was done as part of a management plan for Glen Canyon dam near the Colorado River. The dam is said to be completed in 1963 but overuse of the river ecosystem has today led to its steady decline and also a financial downfall. The ecological benefits of making small changes to water flow regimes was seen in a study by Kiernan and others. After nine years of flow management, native fish regained dominance in two-thirds of the study reach–a 30-km stretch of Putah Creek in California. This should be good news for the dams proposed or under construction in India as the Centre is eager to push irrigation projects. According to reports, National Bank for Agriculture and Rural Development will manage Rs 77,000-crore corpus to complete 99 unfinished irrigation projects across the country by 2019. Maharashtra to move away from big dams?